Successfully Added Car DVD "Mammoth" - GPS, Bluetooth, DVB-T (2 DIN) to your Shopping Cart. 7 inch LCD car DVD player offering high accuracy GPS navigation, free over air DVB-T reception and multimedia mastery is the ideal 2DIN sized media accessory for any car enthusiast. The “Mammoth” car DVD player has a 7 inch LCD display car GPS navigation system that is enhanced and uses the WIN CE operating system to make driving precise and an absolute pleasure. The GPS provides lane assist, voice guidance, 3-D views, intelligent route planning, and points of interest (POI), etc. The “Mammoth” also comes with a 3 meter GPS magnet antenna to significantly boost your GPS signal reception. This “Mammoth” 7 Inch Touchscreen Car DVD Player features an amazing 800 x 480 pixel screen resolution to make disks and videos played on this remarkable system come out crystal clear and visually brilliant. The “Mammoth” employs upgraded firmware with 3D flash menus, brake check disable, and dual zone functionality. Watch MPEG-2 compressed DVB-T on its amazing screen as this car DVD has a powerful DVB-T receiver and intelligent antenna for crystal clear over the air free digital TV. With Digital TV, movies, shows, and news are always free and available direct to your car. In addition, the “Mammoth” has a powerful region free DVD disk player that can play DVD's from any country. Or use those movies, TV shows, dramas, and anime's you've downloaded from the Web on a SD card or USB thumb drive and insert it into this mega car DVD player. It handles the Internet's most popular video and audio file formats like MPEG 1/2, AVI, DIVX, XVID and MP3 with little burden. Attach an iPod or portable media player to the “Mammoth” and have plug and play access to your entire media collection. A free 2GB micro SD card accompanies this 7 inch car DVD player. Also the users can take advantage of the Bluetooth capabilities for handsfree communication therefore you can talk to your callers through the powerful built-in MIC while listening to them through your car speakers. 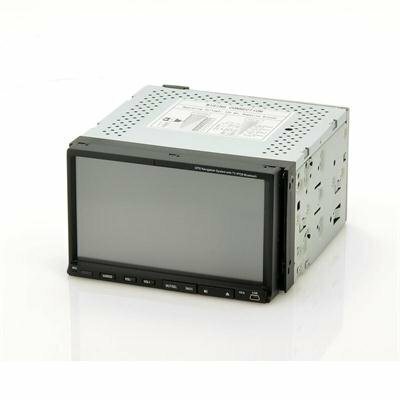 This “Mammoth” is the perfect 2DIN 7 inch LCD screen car DVD player for any car owner. In stock, and if ordered can be shipped out within 24 hours with a 12 month warranty. This amazing in-car total solution is brought to you by the leaders of electronic devices and car DVD players, Chinavasion. This product supports the DVB-T digital TV standard, which is not used worldwide. This model is compatible with most brands of GPS software - however hardware specific software such as Garmin may not run on this unit. As the wholesaler, Chinavasion provides the GPS-enabled hardware only, not the software. Chinavasion provides no warranty or customer support regarding GPS software. Chinavasion cannot provide downloads / links / advice regarding GPS software. Any software installation you undertake should be performed or supervised by a professional. The installation of this Car DVD Player should only be performed or supervised by a professional.